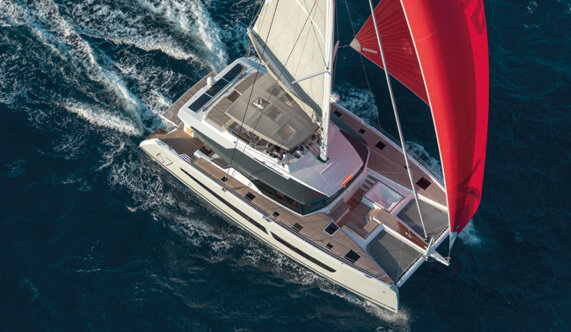 The Aquatiki III is an Alegria-type catamaran, from the Fountaine Pajot range. built in La Rochelle. The comfort on board is worthy of a hotel : a vast square very comfortable, with video corner, lounge library and cocktail bar. 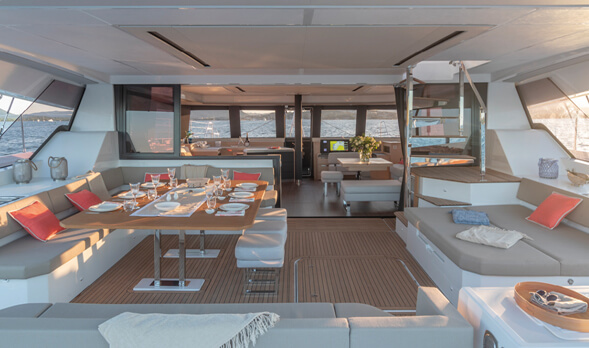 An American kitchen, a vast cockpit sheltered from the sun by a canopy where are served meals, a large sundeck, a front salon and 2 trampolines generally very coveted, a plancha for the grills. Wireless. 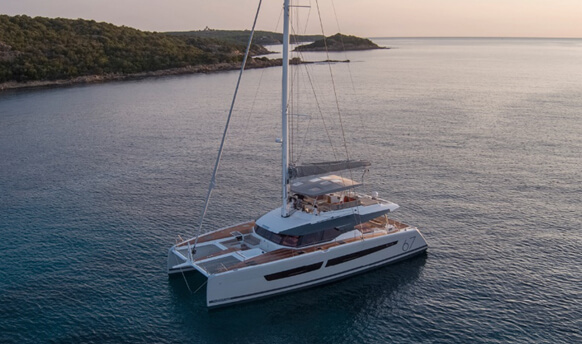 It measures 20 meters long by 9.8 meters wide and has 5 spacious guest cabins : 2 modular cabins (double/twin), 1 bunk cabin for 2 people only, and 2 double cabin VIP equipped TV Hifi DVD, plus a possible front tip. 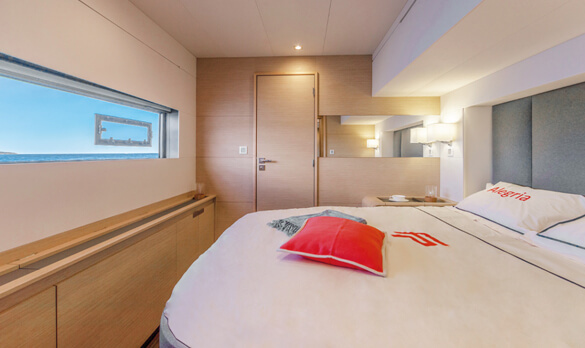 Each cabin has a private bathroom (with cold water and hot water) and automatic WC with fresh water. The propulsion is ensured by 230 m2 of sail and by 2 motors of 150 HP, with more than 1000 liters of tank of gas-oil. 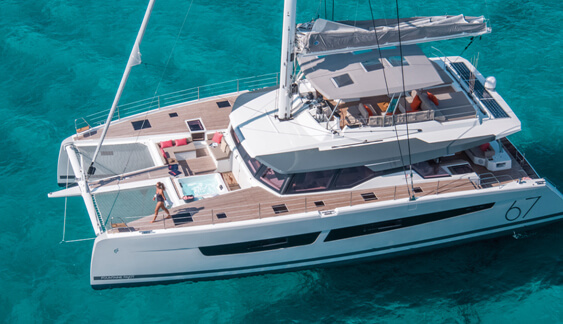 A powerful generator and inverter ensure the electrical production of the edge, delivering 220V continuously, with individual 220V outlets in each cabin 24/7. The aquatiki with sails out The Aquatiki is autonomous in fresh water : more than 800 liters of reserve, with 2 desalinator of 190 liters / hour. (There is no distribution of fresh water in the Tuamotu). Of course, for maximum safety, this ship is equipped with the most complete modern navigation equipment and the latest technical evolutions: autopilot, GPS, BLU, VHF, computer navigation center, radar, standard C weather, beacon Of distress Sarsat. A telephone, a wirless internet spot and a fax by satellite make it possible to stay contactable in all circumstances and even on the other side of the world! Public rates are 3 700 euros per night LOW SEASON in Tuamotu. 1 or 2 BEES diving instructor organizing diving and water activities. The meals consist mainly of fresh fish, real local wealth, and rice; In fact, the bunkering in the Tuamotu is very limited, especially with regard to fresh produce such as fruits and vegetables. Our hostess, real blue cordon, will make you discover succulent local recipes and an inventive kitchen. Bread, brioches, pan cakes, yogurts, all “home”, are prepared on board. On board, table water and lemonade are served at will throughout the day. However, drinks (sodas, mineral water, alcohol, …) are extra. Moreover, a cocktail bar is at your disposal from the end of the afternoon … relaxation and cocktail breakfast. 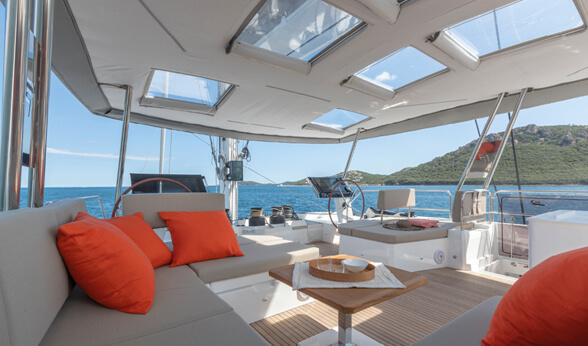 Sailing is usually done very early in the morning and sailing most often in the lagoons or in the open sea. Good and pleasant sailing conditions make it possible to practice big game fishing. Area very fishy !!! Coconut heart tasting.